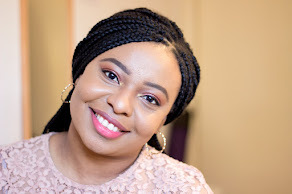 I am so happy to finally put this post up!! 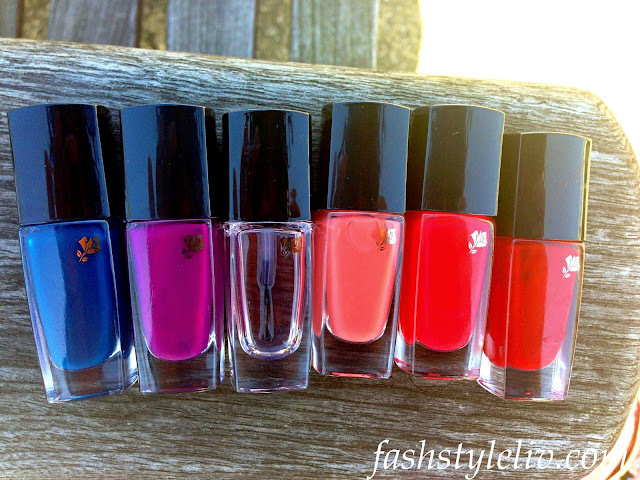 Today's post is about Lancome Vernis in Love Nail Collection. 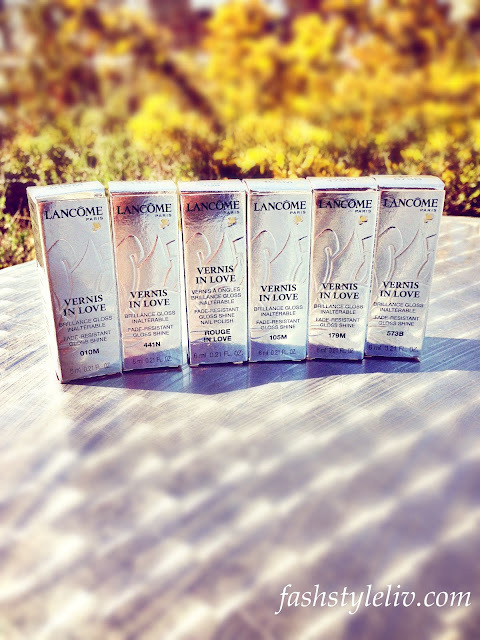 If you have been following my blog, you'd know by now how much I love Lancome products. I think they are all very good quality and they always have good deals especially free samples. In fact, I have got like 3 batches of free skincare and make up products worth at least £70 each with some of my purchases(usually any two products). I heart them and always keep my eyes peeled for their offers. 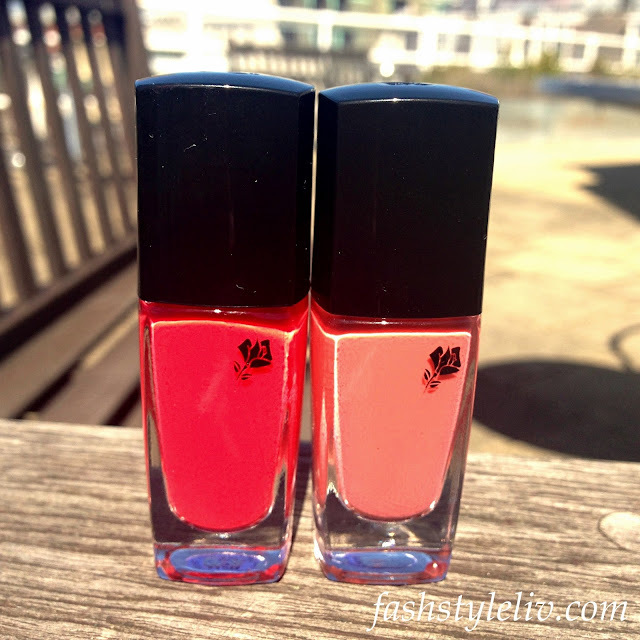 The Lancome Vernis in Love Collection was launched last year(with new additions to the collection in 2013) and the collection's muse was Emma Watson who is the perfect person to have been chosen. Before now, I was never a nail polish person because I found it really difficult to paint my right hand nails with my left hand so I just always ended up painting one hand. Hahahha!! 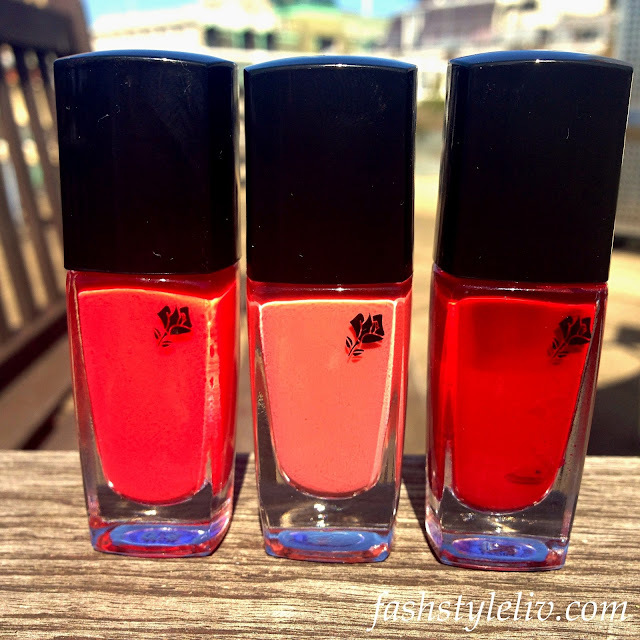 All I wanted was a nail polish that was easy to apply, glossy, quick to dry and slow to chip and crack. 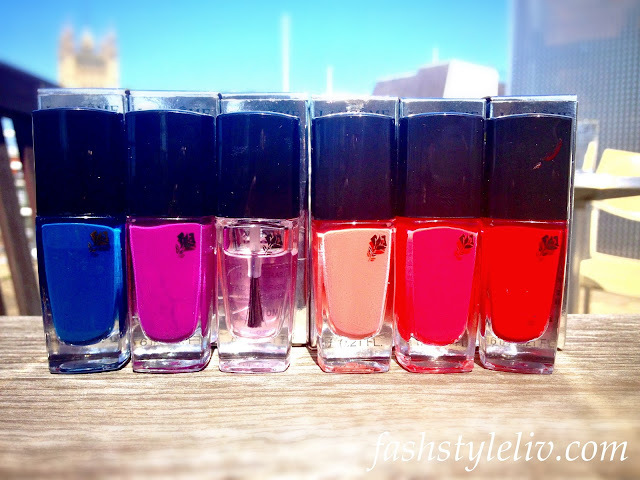 That sounds like a lot that I wanted from a nail polish but Lancome Vernis in Love nail polish collection delivers that and more. I did not buy all of them at once because they are quite pricey as expected from Lancome. I bought them over a period of 5 months. 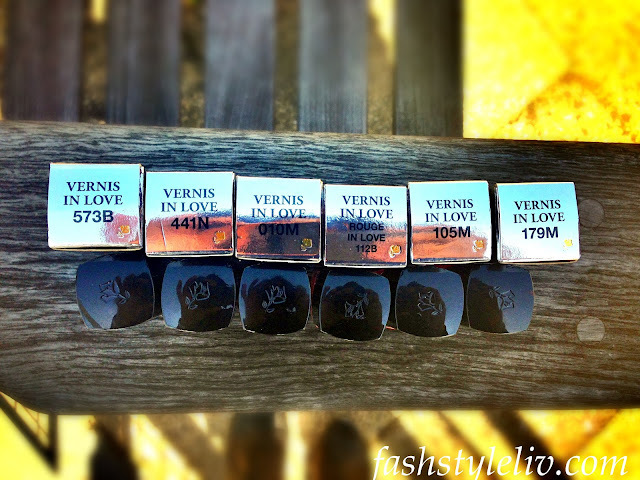 This is not the complete collection either; I have only 6 shades out of 27 shades in the complete collection. 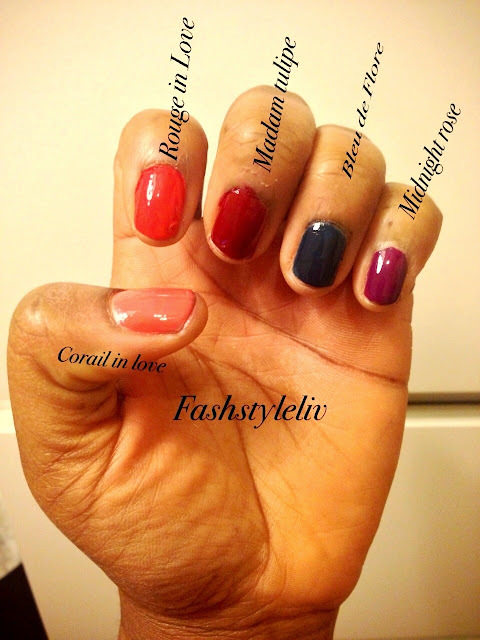 This collection is classified in a rather interesting way; either "B" for Boudoir Time (Pop Shades), "N" for Tonight is my Night (Intense Shades) and "M" for Jolis Matins(Fresh Day Time shades) and each nail polish has a number prefixed before the accompanying letter. I love how the nail polishes all come in its own individual packaging which has a metallic vibe to the outer packaging. The bottles are in clear glass with the tiny Lancome signature flower at the corner The polishes come in sturdy bottles which do not crack easily; I know this because one of them slipped off my hands, fell on a very hard floor and only had a small crack on the bottle. My heart was literary in my mouth the whole time it fell to the floor but thank God it did not get damaged. Don't judge my nail painting skills hahha :-) I'm getting there!! The nail polish brush is very user-friendly especially for new nail painters like me. It is a flat wide brush which picks up a moderate amount of product for a nice coat. In fact, I think you can get away only one coat of polish because it is very pigmented. Its formulation is quite thick yet light on application and easy to dry. 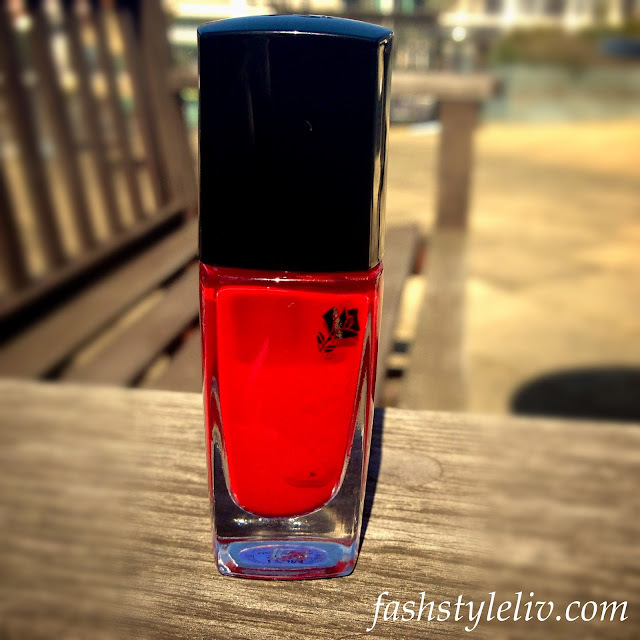 Just as it says on the bottle, it is a high gloss nail polish which is also fade resistant. All the times I have applied these nail polishes, they have lasted for so long which is rare with me because my nail polishes always chip before the end of the week. Each of this nail polishes retails for £12.50 and you get 6 ml worth of products which I think is a bit too pricey for a nail polish. I would not mind paying that amount for at least 10 ml worth of products. 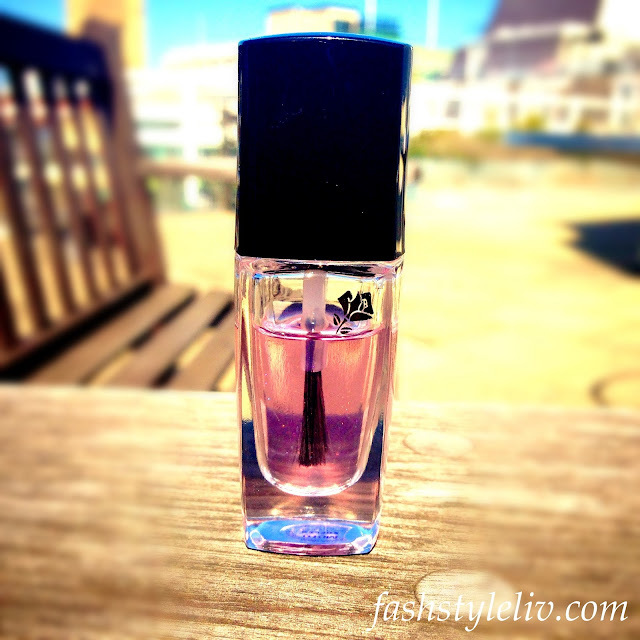 For just 6 ml, I think it's quite a luxury but it is excellent quality so I guess we can forgive Lancome for this. Another downside is the stain some of the nail polishes may leave behind even when you take it off. I find that it is a bit more difficult to remove these polishes especially the darker shades(Madam Tulipe and Bleu de Flore) plus the stain they leave behind after you take it off is not very pleasant.Although, the stain goes off with more nail polish remover swipes but I guess it has to do with how pigmented the formulation is which works to your advantage when applying it and becomes a disadvantage on removal. This was the first Lancome nail polish I bought because I think red shades of nail polish always look elegant and classy. This has not disappointed me at all. Madam Tulipe is a deep warm red colour which I think is perfect for every day wear; it can work well both as a day time or night time look. I think it will be perfect for any skin tone because it looks so classy. In fact, if you are looking to invest in this collection, this is the perfect place to start. This was my second nail polish I purchased because I never had a colour like this. 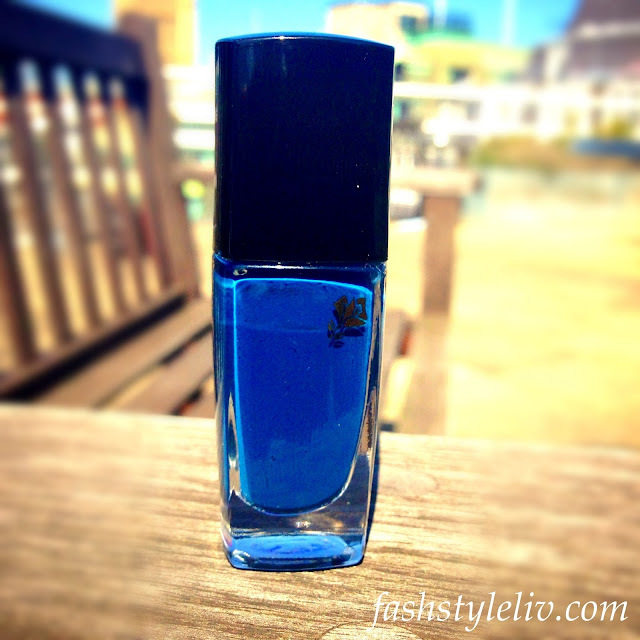 Bleu de Flore is a deep navy blue colour which is quite edgy and cool at the same time. 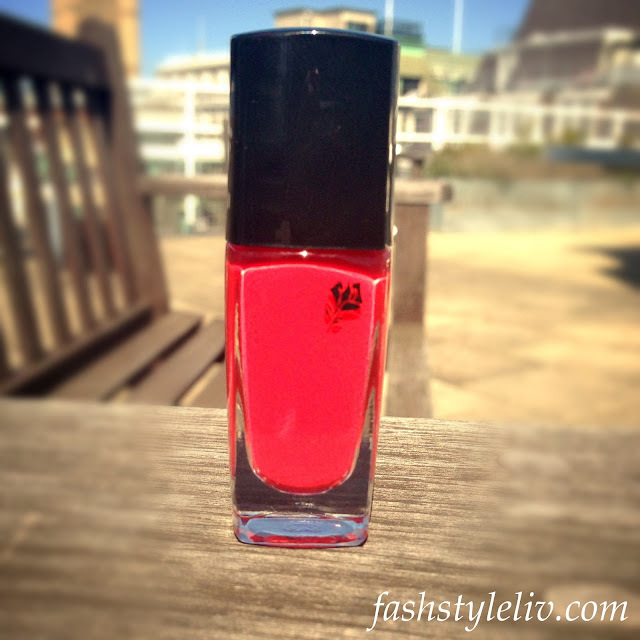 I find that for a rich intense colour, you definitely need two coats of this polish. Funny thing is, I kinda prefer just one coat but it looks a bit too thin. One coat definitely has a different colour; more like a light navy blue or edging towards an electric blue. I think this will be perfect for either warm or cool weather. 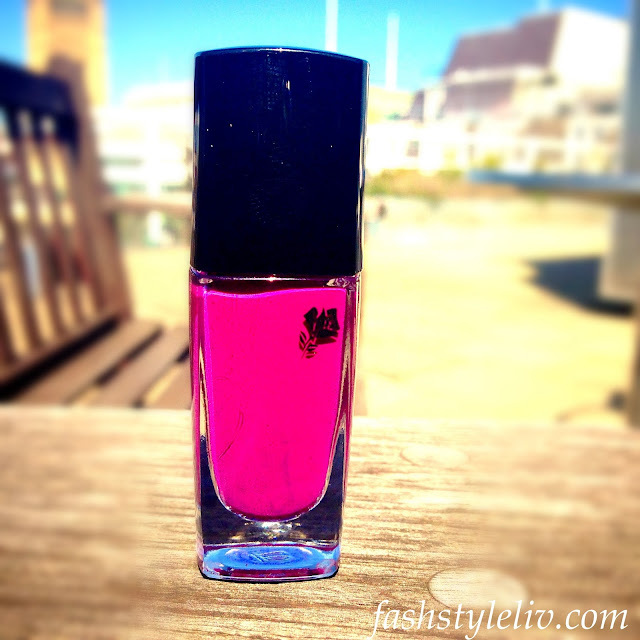 This is one of the difficult nail polishes to take off because it is very pigmented hence prone to leaving a stain. I still love it especially when I want an edgy nail polish. I promise this is not the actual colour. It is actually crystal clear but I have used it so much especially with my Madam Tulipe and Bleu de Flore which are notorious for staining which is why it has a pinkish/blue tint to it. It kinda looks nice though so I am not too bothered. Cristal Quartz is the perfect nail polish top coat I absolutely adore. Although, all the other coloured nail polishes have high gloss and are fade resistant, this top coat adds an extra glossy finish to the colours and prevents the nail colour from chipping thus promoting longevity. 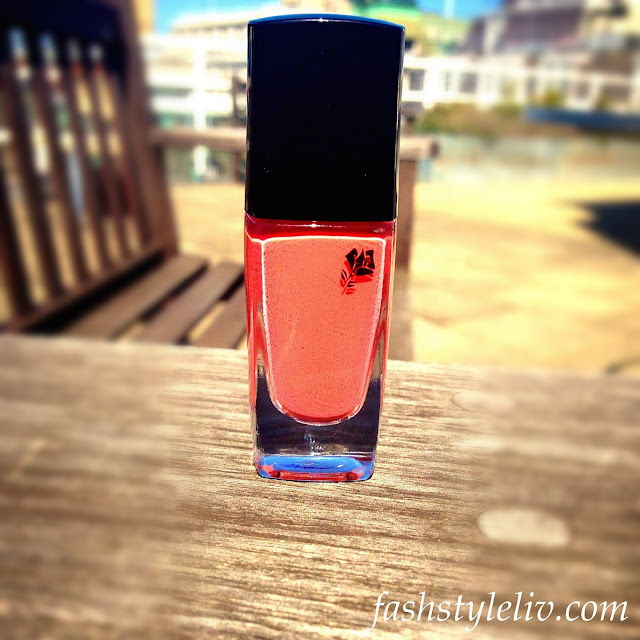 Corail in Love is the perfect shade for spring especially if you like delicate, feminine and fresh colours. It is a subtle light pinkish coral colour. It has more tints of light pink rather than orange so it is not very bright. My boyfriend loves this colour best on me and I love it as well because I think it is very much my every day style. It is true to shade; what you see on the bottle is what you get regardless of how many coats you have on. I think this has an accompanying Lipstick in the same collection. This was the actual nail polish used in the campaign with Emma Watson and I understand why. It is a bright red cherry colour which really pops. 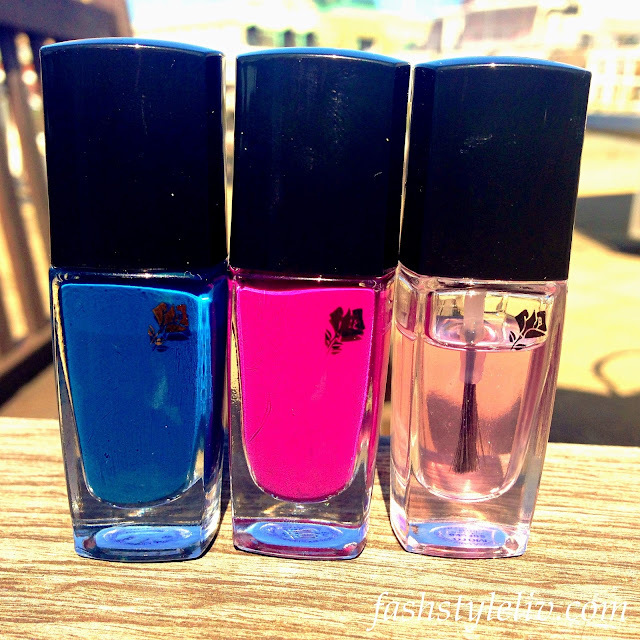 It will definitely get you noticed because it is a bright nail shade. It is the most perfect shade for spring out of the lot I own. It also has a matching lipstick in the collection. It was quite a pain to photograph because I really tried my best to capture its true colour. Regardless, it is a beautiful colour which reminds me of being carefree and adventurous. *DISCLOSURE: I have no material relationship to any brand or person mentioned in this post. All Opinions are mine and the products were bought and paid for by me.